Move Your Ch'i ... Manifest Your Desires! It's Spring! Time to open the windows and let in some fresh spring air. It may also be time to get your "ch'i" moving, especially if you are feeling stuck in your life. There are a number of names for the ch'i energy. Some people call it cosmic, God or universal energy, or the cosmic breath; others describe it as the Life Force, or the force that links us to everything in the universe. It is the energy that gives us life because it fuels the processes of our bodies and our environment as well as the cosmos. Many people believe that when we are stuck or blocked in life, it is because our ch'i is stagnating. Thus, as we take care of our physical environment, we unblock obstacles to the flow of ch'i and also tune into a powerful way to get things moving in our careers, finances or relationships. Some people call it "Feng Shui" or simply decluttering. It's all about taking actions that support your intentions in life by making space -- literally -- for what you desire. Feng Shui is the buzz word of the day it seems. I recently attended a Feng Shui class in which there were over 30 attendees. And no wonder there is such interest -- it is a tangible, straightforward way to experience more causation in your life. Feng Shui (pronounced “fong schway”) is based on the idea that your environment is a physical manifestation of you, your life, your psyche and your subconscious self. It is uncomplicated in its explanation, but it is also multi-layered and has great depth. By examining your relationship to your surroundings, Feng Shui strives to bring harmony, peace and prosperity from the physical arrangement of your world. Proponents of Feng Shui prefer to call it an “art” -- the art of placement in our environment which will bring about balance and the enhancement of our environment. It is about harnessing energy and making the energy flow smoothly through our homes so that it will similarly flow in our lives. Sarah Rossbach, author of Interior Design with Feng Shui states, "The point of Feng Shui is to harness and enhance environmental ch'i to improve the flow of ch'i within our bodies and minds, thus improving our life and destiny." There is a map called the "Baugua" that spells out exactly where and how to improve our Feng Shui. However, before we get to it, there is an important FIRST step and this step is one of the most critical aspects of freeing up your ch'i -- and that is to clear your clutter. Karen Kingston, author of Clear Your Clutter with Feng Shui, says that clutter clearing is the cornerstone to the practice of Feng Shui. She says that clutter clearing and Feng Shui are actually the SAME process – and it is the one process that is the most transformative aspects of Feng Shui. She states: "Feng Shui cures and enhancements are at best only minimally effective until clearing has been done." How and why do we create so much clutter? Clutter is the result of our busy lives as well as the consumerism that permeates our culture. And when "stuff" and clutter accumulate, energy stagnates. And when energy stagnates, clutter accumulates. A vicious cycle! Clutter is often a symptom of what is happening in our lives -- a sign that our energy is blocked. But then it adds to the problem by creating more stagnation. The more clutter we have, the more energy will be stuck and the more we will attract similar stagnant energies to ourselves and our homes. Like attracts like! Another key principles of Feng Shui is this: You energize whatever you focus your attention on. It is worth noting that the word "clutter" derives from the Middle English word "clotter" which means to coagulate. Not exactly a nice image is it? Your clutter coagulates and keeps you stuck. Energy gets blocks and stagnant around clutter. YOUR energy gets blocked and stagnant around your clutter. The principles that govern Feng Shui are similar to the principles that govern the Tarot system. That is to say, when you want to develop some aspect of yourself, you chose a Tarot image that captures that quality and meditate on it, carry it around with you, draw it and so on in order to impregnate the mind with that potent imagery. The symbols you choose in your home similarly feed your mind -- and clutter is a symbol! The external clutter in your life is symbolic of unresolved internal issues that may relate to fear, low self-esteem, scarcity consciousness and the like. Symbols send you messages. So what message does your clutter send out symbolically? What are you telling your own unconscious mind and what are you telling others who come to your house? Ms. Kingston says, "Every aspect of your life is anchored energetically in your living space, so clearing your clutter can completely transform your entire existence." Now there's a powerful thought! In her book, Kingston points out some of the insidious side effects of clutter. These include: procrastination, diminished self-esteem, feelings of shame, regret and guilt, diminished social life, feeling out of control, living in the past, reliving past issues, fostering feelings of irritability, hopelessness, lethargy, and exhaustion; there may be health hazards, extra cleaning time and expenses, and so on. In essence, having clutter in your space (this includes your workspace as well) creates extremely undesirable symbology and that undesirable symbology is reflected throughout your life. So, if you really want to GET RESULTS, start from the inside out -- take a look at your clutter issues. As we move into the fresh energy of spring, remember that clearing your clutter can be a way to both move your ch'i and to express your intention. What do you want in life? Clear your clutter to create the space to let your goals in. Give away old clothes and books (or give them to a homeless shelter). Throw away pictures, objects, items that energetically making you feel guilty, sad or regretful such as painful photos, gifts from your "x," family decorations -- anything that you don't need or use anymore. By doing this external clearing, you are also clearing out your inner self, or your personal ch'i. Start small, if necessary, a drawer or one cupboard. Release, release, release! Similarly, if a door sticks, fix it. If a faucet leaks, fix it. If a door squeaks every time you open it, oil it. These kinds of annoyances are taking energy away from your power to create! As you deal with your clutter, you will have a sense of power that will transfer to all aspects of your life, including creating the space needed to achieve your goals and desires. Another way of looking at Feng Shui is the artful placement of physical objects in the environment in order to bring balance and enhancement to the environment. By harnessing the ch'i energy to flow smoothly through your home, it will flow similarly in your life and thus, as Rossbach states, "to improve your life and destiny." In other words, the ch'i should flow through your world smoothly, evenly, without obstructions. Once you have worked on your clutter issues, you can begin working with the "bagua" and incorporate some of the other basic principles of Feng Shui. You may be familiar with the Feng Shui principle that states that the arrangement of your home’s interior is very important. Thus, another important principle of Feng Shui is based on the bagua, which is derived from the I Ching. The bagua offers a “map” or plan that shows you which parts of your home represent and correspond to various aspects of your life. By superimposing this “map” onto your own home (with the home's entrance at the bottom of the diagram), you are able to both diagnose and "cure" environmental problems. As you can see by the bagua below, the farthest right corner from the home’s entrance is the relationship/partnership area. The other far corner is the wealth area and so on. Proponents of Feng Shui suggest that you can choose a particular area in your life that needs attention and then make the corresponding area in your home of special importance. This importance can be achieved by a distinctive object, a lush plant, a mobile, a light (to symbolically shine light on the area) or a crystal. Such items will draw ch'i to that area, and will also remind you of your intention in that area. As you place your attention on that area of your home, you also symbolically nurture and draw intention to what it represents in your life. What does any of this have to do with the Tarot? The Tarot is a system of images that we use to understand the wisdom that resides within our own psyche. It, too, is a map – a map of your psyche and of your spiritual and earthly journey. The images of the Tarot portray the totality of the human experience and provides a guide for achieving the highest wisdom available through its universal imagery. The unconscious mind is brimming with images and pictures; the Tarot images become a visual expression of what is locked up within. As a powerful tool for the creative imagination, we can use the Tarot images to visualize and attract that which we seek. 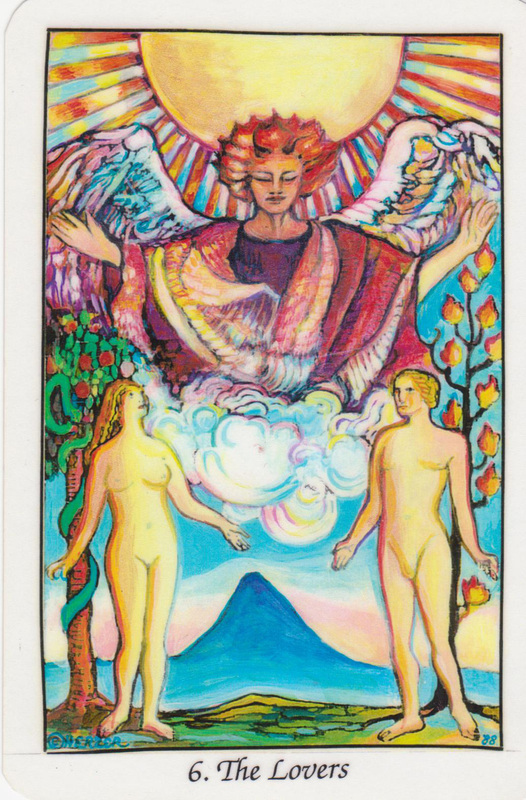 For example, The Empress card, representing Mother Nature sitting on her throne, is often associated with creativity, abundance, the creative spark made manifest. If you are a writer or painter and wish to expand your own creative energies, or if you wish to expand your wealth, prosperity and consciousness of abundance, this would be a strong card for you to meditate on, carry with you, or place under your pillow at night. The goal would be to “impregnate” your consciousness with this fertile imagery. Both Feng Shui and Tarot are methods of gaining insight and provide a means to actively participate in, and create your inner and outer life. Feng Shui teaches that your physical space mirrors your life, and that by changing your external world, you also change your inner world. Tarot teaches that its images mirror your life, and that by working with these potent Tarot archetypes, you are able to release images that have been locked within you, and thus also change your inner world. Both systems use physical reflections as metaphors to create changes in the inner realm. Now, this is the exciting part of the union of Feng Shui and Tarot. What if we were to place particular Tarot cards in strategic Feng Shui areas in our homes? Wouldn’t the portrayal of an inner need or desire, as captured by the Tarot image, placed in the right spot on the bagua, draw ch'i to both the image and the area in the home we intend to develop? Here’s how to start. First, pick only one area in your home that represents a specific area in your life that you wish to enhance. If you have several areas that need attention, focus on only one at a time. Otherwise, your energies might become too scattered to have effective results. For example, let’s say that you want to focus on your finances, prosperity and wealth. You would first clear the wealth area in your home, as indicated on the bagua. As mentioned, traditional Feng Shui might suggest that in this area you place a leafy green plant (to symbolize growth and expansion) or hang a crystal, mobile or mirror to get the energy or ch'i moving, or place a red object to symbolize energy. When combining the Tarot into this practice, a card such as The Empress can also be placed in this wealth corner. The Empress is Mother Nature, the ultimate symbol of fecundity and she is surrounded by lush imagery. By placing this Tarot card in your wealth area, you will draw energy to that area as well as provide your unconscious with this flourishing imagery. 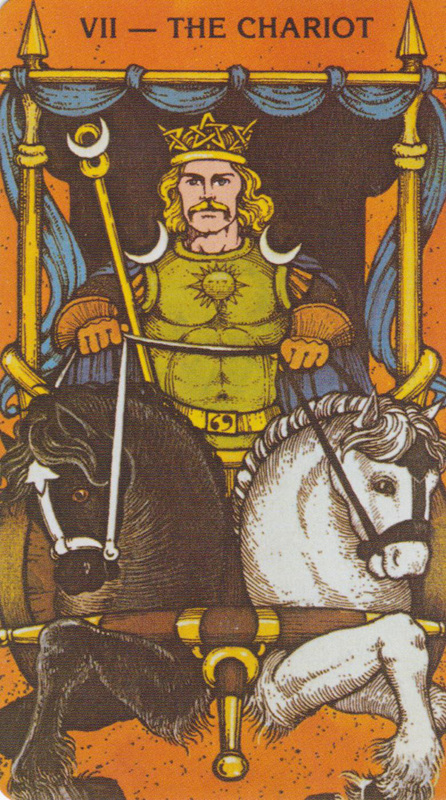 Or, you might instead choose, The Chariot card since this is a card that portrays the concept of taking charge, putting yourself in the driver’s seat. This might be a particularly good choice if part of your financial concerns stem from excessive spending, overuse of charge cards, getting too far in debt, lending money to others or any similar inability to have control in your finances. You could also use both the Empress and the Chariot cards to expand your ability to prosper as well as take more responsibility for your finances. However, I recommend that you limit your selection of cards to only one or two. Here’s another example: Suppose you seek a romantic relationship, a potential partner or the deepening of a current relationship. 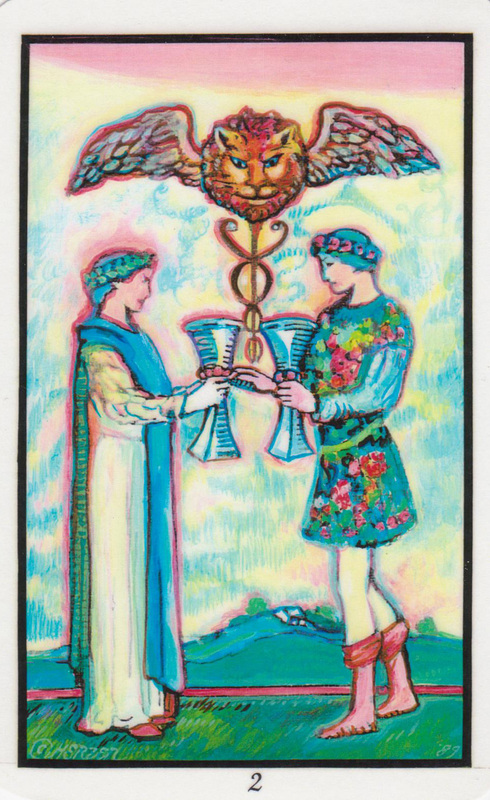 Depending on what you want, you might place The Lovers Card, the Two of Cups or even the Ten of Pentacles in your relationship corner (all of these Tarot cards depict couples, either looking at each other, touching each other or in some way expressing their connection to each other). Placing this compelling relationship imagery in your relationship area enhances the impact of both the image and the corner. You may want to add a red or pink candle, an African violet or some similar article that conveys love, compassion and relationship. It might also be useful to contemplate exactly what you seek in a relationship and then find a specific Tarot card that captures that ideal. What if you don't feel really confident or comfortable in your knowledge of what specific Tarot cards mean? Don't worry about what the cards "mean." Look at the imagery on the cards and choose cards that most resemble what you seek. These are the cards that you will place in the chosen area, as a means to draw energy to that area in your life. Simply place the card in the appropriate corner. You could also put a special frame around the card or anything that you hold dear and that has positive memories. The goal is to "magnetize" this corner of your bagua with your special desires. Both Tarot and Feng Shui are about creating energy, intentionality and drawing from the spiritual, mystical and unseen forces that govern our lives. There are, of course, no guarantees, especially if there is a part of you that is unwilling, or has some inner resistance to what you seek. Unresolved fear of intimacy, unacknowledged feelings of lack of self-worth, uncertainty as to whether you deserve success –- any of these may act as impediments to the success of your Feng Shui and Tarot endeavors. And, of course, any tool, be it Feng Shui, Tarot, crystals or whatever you choose, can never absolve you from taking personal responsibility. Using these techniques are ways to raise your intention and raise your energy. They are mystical tools that help you to stretch your soul and psyche. They are aids. You still have to take the necessary steps to achieve what you seek. The power, always and ultimately, rests in your own hands.